Come To Medieval Times whereyou’ll feast on a four-course banquet served in true medieval style (translation: your hands are your fork and knife). 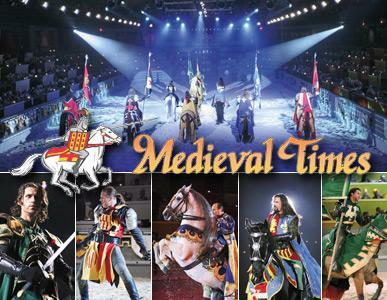 While you are feasting ,enjoy a tournament as you watch six “Knights of the Realm” engage in a variety 11th-century inspired entertainment, including live jousting, sword fights, equestrian skill and falconry. Want to go Live Life Half Price style? Your in luck use Promo Code: “FEAST16” to get child tickets for $27(regularly $37) each or adult tickets for $37(regularly $55) each to Medieval Times Dinner & Tournament in Lawrenceville. Valid for tickets to most shows through January 31, 2017. Must mention or enter code FEAST16 at time of purchase. May not be combined with any other offer or group rate. Tax, gratuity and applicable fees are additional. Upgrades are additional. Not valid on prior purchases. Not valid for NYE show. Valid at the Atlanta castle for shows through 1/31/17. Monday, December 19 – Thursday, December 22: Doors open at 5:30pm, knight training begins at 6:00pm, show begins at 7:00pm. *Children must be between the ages of 5 and 12 to participate. Space is limited and training is available on a first come first serve basis for the first 80 kids. Training is open to both boys and girls. Closed toe shoes are required to participate. Valid only at the Atlanta location.